I feel bad not updating the community more than I do so I'm going to start trying to post a few submissions a month to let you guys know what we have going on in the code world. So here is a quick ad-hoc rundown. We decided to tackle an issue that we've had for a while that resides deep down in the code. It concerns the nature of asynchronous vs. synchronous work flows. When Voat was originally built, async code was just becoming a practice and not widely used. Because of this a majority of Voat was implemented using a synchronous work flow. As new code was written, we began rolling out async code on top of areas that were implemented synchronously. Not ideal. One large area is the cache implementation. Voat uses a rather sophisticated cache compared to most implementations (Voat supports a hot-cache behavior where data is reloaded in the background independent of a request, rather than on the fetch request itself (which would make a user wait if expired)). We have all unit tests passing, but we have introduced some rather tricky bugs that still need resolved. This new async code is running on preview, and that's why preview has some wonky things happening randomly. So the work continues in this area. As far as the new Vote code, we have one major issue to address before we begin beta testing on this feature. It just so happens that the issue is in concerns to asynchronous code as well, but not in the implementation, in the design. Votes may have "restrictions" that certify the user vote as either certified or uncertified. These restrictions can be very query intensive. Currently the code was written to run before the user's vote was saved. With testing we have realized that this isn't realistic and must be processed independently in the background instead. When we finish up with this change we will beta test Votes and hopefully roll them out for subverse transfers shortly after. Packages started off as a way to implement subverse CSS and store images on Voat so that we don't expose users to third party sites (we are constantly looking at ways to make a Voat user's footprints lighter around the internet). As we began implementing this feature, we realized that by extending it in a few areas we could literally do anything client side. So we dedicated a bit more resources to this end and agreed that when we could port and run AVE (an old browser extension for Voat) natively we would consider it "feature complete." It is now feature complete. The additional work associated with launching this feature revolves around security and isolation as well as making the UI waaaay more user friendly. So, VoatDev, that's a bit about what we are working on code wise. Voat has strip searched your title and removed it's its unicode. Please verify you approve of what you see. Found 2 XSS bugs on the live site, one is stored the other is reflected. They can both be used to take full control of an account and perform actions on their behalf (post/voat/subscribe/pm/steal data/delete account). I would be surprised if attackers didn't already know of at least one of them. To everyone else: I'm not going to release any details and will not leak anything for any reason. ...when you click to the post it anonymised. Is this a setting when they delete their account or a bug? Not that I care a lot but I just got notified of a reply to a comment on /QRV that I didn’t make. It would appear there is some sort of linking problem. Perhaps a counter overflow? I got tired of the crap from v/guitar showing up in all so i blocked it. When they have their Friday circle jerk it still shows up because they post it as a sticky. Please either ban that subverse for spam or make a block actually block. No thumbnails for webm/mp4 link submissions, they don't generate. They used to autogenerate, this stopped when the Linux switch happened, I can pinpoint this timeframe concisely. This should be a really easy fix, a Boolean true false probably. I would like to be able to save my own Comment history, and private messages Sent and received in a format offline I can search. Please excuse my utter tech ignorance, but does something like this exist? Is it even possible? Every so often I get tricked into clicking on some idiot’s YouTube link. But even in the remote possibility it isn’t medium grade spam I still don’t want to have my phone blaring a video. It would be nice if there was a special icon that helped identify YouTube, twatter, and other low quality posts. Maybe a way to blacklist domains like you can block a subverse. Honestly I NEVER want to know Twitter even still exists. Maybe in the future ? Click the refresh/delete button under a post. There's barely any back-end to that UI yet - it doesn't make API calls or update the database - so feel free to play with it. For one-off posts I can simply refresh that post via the API. There will be appropriate throttling, of course. My question is: how can I detect, via the API, that a user's posts have been deleted or anonymized en bloc? I see there is a user badge called "Account Deleted" with the description "This goat has gone to goat heaven" with 2 slightly different images: https://voat.co/images/badges/deleted.png and https://voat.co/images/badges/deleted2.png. I assume this indicates that their posts were deleted/anonymized at the moment the badge was awarded, but it does not seem to be consistent. An extra complexity is that presumably a user whose posts have been deleted/anonymized, and who "earned" the badge, can then continue to post normally. @gabara is an example. Can anyone please help me with suggestions about how I might tackle this? A neat feature for Voat (as some of the subs are pretty community focused) would be to automatically keep track of things like a user's SCP/CCP or even number of comments or submissions. Because then you could, for example, automatically 'reward' people based on their contributions or participation. In other words, if someone gets 1,000 SCP in the sub then you could automatically apply a flair to their username. Alternatively, you could automatically make them an authorized submitter. You could have things like username flairs that are like military ranks, so people go up through the list. This may increase participation - 'cause who doesn't like rewards for contributing? It may even be used creatively. I could see it being useful in gaming subs, or even v/traditionalwives as a way of automatically rewarding/denoting people who have been active contributors. And, best of all, it'd be easily automated. Just keep track of the SCP/CCP/number of posts and drop in a fairly basic sub owner/moderator control panel. You see similar with some of the forum software, actually. The more they post, the higher their ranking goes and it may also confer extra features as the number increases. I could see this being a way to encourage more community participation for those subs that are more about the sub as a community. Hell, @clamhurt_legbeard would have a field day with it in his AIDS sub, SDBH. SBBH would even use it, but not very well and it wouldn't ever actually make any sense. The gun club sub, traditional wives, FPH, and other such subs may all find that feature handy and find creative ways to use it. Similar to YouTube or SoundCloud, basically. I know it can be done, 'cause they made it for me on Phuks. I don't expect this to be even remotely a priority, but it'd be a nice feature - specifically for the weekly guitar thread. It's kind of annoying trying to submit to a relevant subverse, when more than half of the subverses are disabled. I keep getting error message "subverse is disabled" when I aim to post to such a subverse. IE if a post arrives only minutes after the clock ticks over to a new day, what time zone is it at? 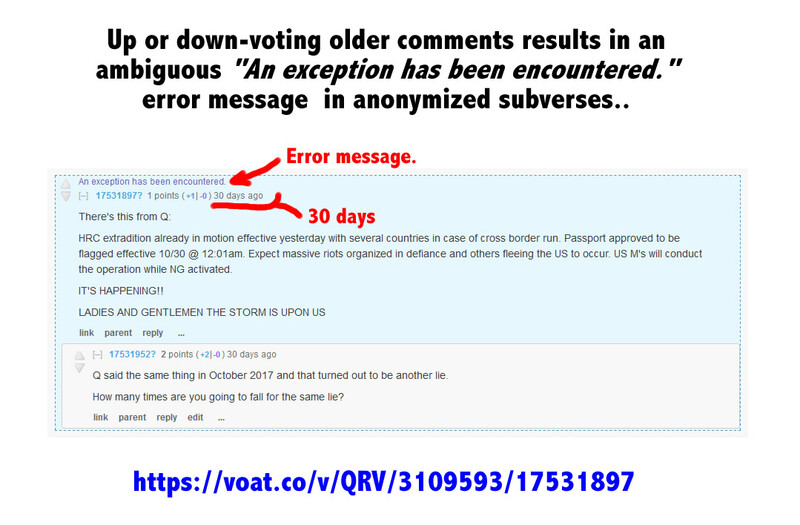 I've got a troll on v/pizzagate constantly attacking the mod team claiming we rigged our moderation subverse so as to prevent downvoting by users. I'd like to understand the timeline, as this was before my time. It was apparently set to 10 CCP required to downvote when first created. The subverse is used for posts about rule changes, complaints about mods and other meta topics. Here's an example of one of his claims: https://archive.fo/fvNlj and a more recent one https://archive.fo/OcAjs. I've noticed that when I downvoat a submission its score will decrease dramatically. I'd expect my voat to count for one point against the submission, but it often appears to be a lot more. I've seen submission scores go from 85 to 4 when I click the downvoat button. It feels good, but feels unfair. What's up with that? /v/all gets dominated by the default and popular subs. This isn't just a voat issue. It's happened on reddit, too. It stifles smaller subs about really interesting topics, and kills them. In my exploration of voat, I've come across a lot of dead subs, or subs that would be a lot bigger if they had proper exposure.